If there's anything I'd like to do this year (besides use the supplies I've already bought!!! ), it's to try some new techniques in paper crafting. On my last trip to Archiver's I picked up a few Hero Arts Frame Stamps. When I saw this stamp it SCREAMED for me to try the emboss resist technique. You can find THIS wonderful picture tutorial from Splicoaststampers. 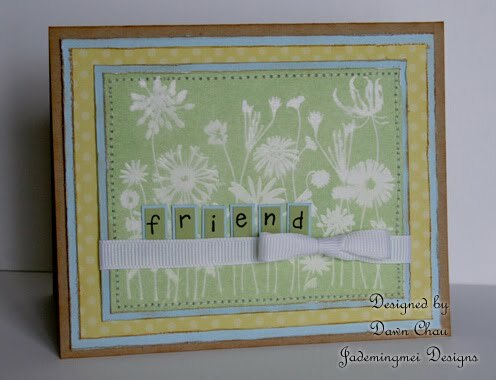 I clear embossed my design on white cs, then rubbed my Dew Drop--Aloe Vera over the embossed area. Once I got the ink coverage I desired, I went back and rubbed off the excess ink and it revealed the clear emboss. 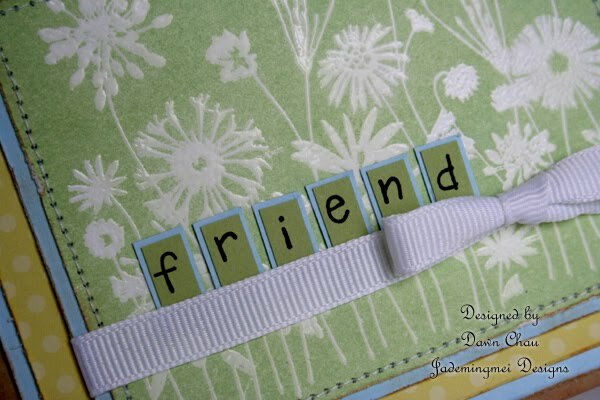 I knew I wanted to add a sentiment, but I didn't want it to be overbearing and cover up the floral image. My snap stamps were a great solution...simple FRIEND...letters were stamped individually and then I hand cut the baby blue matte. This is something I'm definitely looking forward to trying again! Snapshot of yesterday...this is in the middle of the storm...hard to believe the beach is only 15 mins. away??!! Looks like the snow will stick around as it will not be above 40 the rest of the week and school has been out for 2 days now. Chan and I got this crazy idea to drag the kids around the neighborhood, on boogie boards, in the freezing rain! We all had fun, but my arms are thanking me today! Gorgeous, Dawn! The green is so cheery! Makes me wish for spring, especially with all that ice out there right now. Valentine's Fun Dip Bands...plus tutorial!